SUNSET ALERT! When the sun sets tonight, go outside immediately and look west. If you have a clear view of the horizon, you may be able to see a beautiful gathering of the slender crescent Moon and Mercury. Just one problem: Because they're so low, they may not be easy to find. Try scanning the horizon with binoculars for a truly fantastic view. 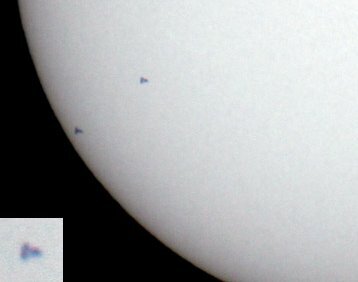 SPACE STATION TRANSIT: For photographers wishing to catch the International Space Station (ISS) in solar transit, Laurent Laveder has a few tips: "1. Never decide to photograph an ISS transit just 30 minutes before it begins. 2. Never try to focus on the Sun when there is no sunspot, because it's hard to focus. 3. Never trust your laptop's clock, because you could miss the beginning of a split-second transit and capture only two silhouettes of ISS." There's more: "4. During the photo shoot," he says, "never stop your car along a road a few meters from a house, because an old man could observe your suspect behavior for at least 15 minutes, increasing your nervousness. 5. Never give your real name to onlookers." And most importantly, "6. Never send your infamous picture to Space Weather, because it could be shared worldwide." 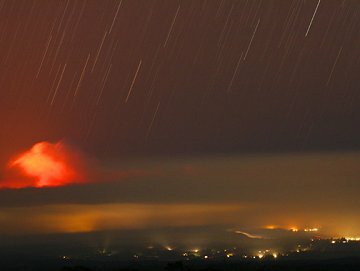 "This shot shows the volcano still erupting after all these years with an ominous glowing plume looming over the sleepy village of Volcano, Hawaii, which is immersed in volcanic smog (vog)." And, no, that's not a meteor shower over the volcano. Those are star trails. O'Meara opened the shutter of his Canon 20D for six minutes, allowing the vog to drift and Earth's rotation to streak the stars. Twenty-five years and six minutes later, the eruption continues. On January 9, 2008 there were 916 potentially hazardous asteroids.